Can I have Insulation Around My Recessed Lighting? You are here: Home » » For the Homeowner » Home Maintenance-Consumer Info » Can I have Insulation Around My Recessed Lighting? To have better energy efficiency we need insulation. For design reasons, we want a recessed light. These two things do not always go together. Good design may not mean efficiency. We want our homes to look good. Elements like lighting should be unobtrusive, unless you have a beautiful lamp. We also want to lower our energy bills, which for most of us means adding insulation. This is where problems ensue. Recessed lights can become quite hot, which can be a fire hazard when the insulation is covering it, but if no insulation is covering it, how do we improve energy efficiency? To ensure that no fire can occur, some home owners move the insulation far away from the lighting. Other pack the insulation onto it without a concern (and I have seen burn marks on insulation so packed). So what can we do. The photograph shows a home where the insulation was moved well away. There are recessed lighting unit that are designed to be completely covered with insulation. If I was going to use recessed lighting, that would be the type that I would want. I prefer track lighting myself. Some modern track lighting is unobtrusive. They are designed well, and they provide more light than a recessed light, so you need fewer of them. If you are planning on installing recessed lights, ask the store if they have the type that can be covered with insulation. This type is usually in a box. The real problem is for the homeowner who has recessed lighting in his home already. Can he put insulation on the lighting? Some units are not designed like a box, so you may have something that looks like the picture. Is it a unit that needs the insulation away from its housing? The first place to check is the tag on the unit. Tags can be filled with useful information describing the unit and installation requirements. Insulation can be placed above and around units that are identified with the wording “Type IC”. If the unit states that it is Non-IC or other designator that does not mention type IC, or if the unit has no tag, then you do not want insulation near or above the unit. The reason behind not putting insulation around units without tags is that you do not know what type of unit it is. Type IC fixtures dissipate the heat into the room with the fixture, so trapped heat does not occur, causing fire damage. What if I do not have the type IC unit? These fixtures create heat that needs to be dissipated. This heat will be in the metal parts of the housing. Do not cover the unit with insulation. Keep insulation well away from the sides; three inches is a good amount. If you use batt insulation, you can cut the batts to size, and they will stay in place. 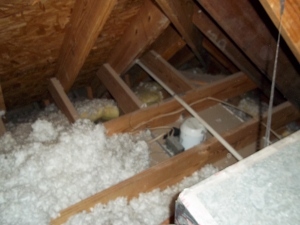 Blown insulation can begin to tumble out of place onto the fixture. My solution is to create a cardboard ring that stays away from the housing. Insulation can be blown around the ring, with the cardboard being high enough to meet the insulation height (at least 14″ ). When blowing insulation into the attic, you can just blow, and then go to clean out the insulation near the recessed lights, but they are hard to find. I would place a marker by each light that stands far taller than the insulation, so all of the fixtures can be found again.This is for those of you blowing a lot of insulation in from one location of the attic to a greater space. Obviously, if you are only adding the insulation around one light, then you will find it again. Is this energy efficient? Like I said, I prefer track lighting, and I also love my decorative lamps. Recessed lights need a greater lumens to create the light effect of a bulb which is in the room. This means that they need to use more watts to produce light. The problem also becomes harder to maintain conditioned air’s temperature, because you have an area where thermal bridging can occur. Replacing recessed lights with type IC recessed lights is the best option if you do not have this type of fixture or if you are going to install recessed lighting. This entry was posted on Tuesday, February 1st, 2011 at 3:00 pm	and is filed under Home Maintenance-Consumer Info. You can follow any responses to this entry through the RSS 2.0 feed.